Very Good. 12mo-over 6¾"-7¾" tall. 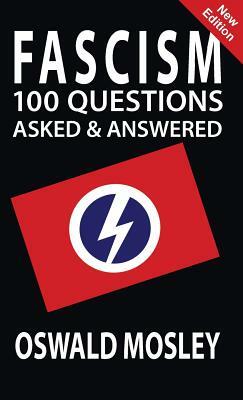 Very scarce copy of the book about Fascism set out in a Q&A format, and authored by Oswald Mosley. Includes his opinions on Roosevelt's New Deal, ribbon development, freedom of speech, and why they use a black shirt. Very tidy copy although covers are slightly sunned. Internally tight and clean with a small newspaper article about the rise of Germany's population inlaid. Volume 1 in the Fascist Shilling Library. Fine. 1910881783 Clean, Unmarked Copy. Manuscript. Booklet [6x8]; pp 54; VG-/paperback; black spine without text; covers have slight rubbing to exterior; intact panels; text block is clean; frontispiece. FP New Rockville Stock.